We all have been placed on the Earth for a limited period of time and since none of us are going to be here forever we should try to make each moment count so that many years from now when we are old, grey and hardly able to move, we have no regrets about the way in which we have lived our lives. So if you are someone that would love to make each day count, then here is a comprehensive list of productive things you should try doing. Studying hard and gaining a proper education is of paramount importance to be a part of today’s competitive twenty first century world. However it is equally important to remember that being book smart is of no use as companies prefer to hire people that are able to put that theoretical knowledge into practice and come up with quick and easy solutions to any problem. If you do not study hard then finding a good job will certainly not be easy. Rather than being locked up at home it would be a great learning experience to get out and travel the world. Rather than looking into geography books, what better way to learn and spend your time than to actually visit these places and get the knowledge first hand. There is hardly any feeling more rewarding than going hiking and then gazing at the view once you have reached the top of the hill or mountain. The best way to learn about new cultures is by interacting with people and learning about their way of life. All you have to do is take a train or bus to the suburbs of the city in which you live in, to gain a wealth of knowledge about the ways in which various people live. Their way of life might open your eyes and sensitize you to the problems they face on a daily basis. Things that you might ordinarily be taking for granted might indeed be a luxury for them. Many people take up jobs that they don’t love doing, simply because it is something that their parents would like them to do. However you should remember that doing something like this is very wrong indeed as over time not only will you grow to resent your work but you might also begin resenting your parents for their decision which they imposed on you. 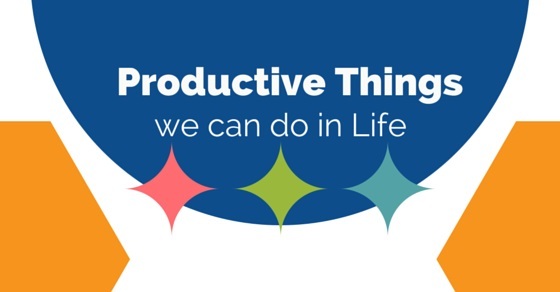 Rather it would be more productive to focus on a job which brings you immense satisfaction. A productive thing to do in life is climb the ladder of success with a lot of hard work as well as perseverance. Many people often choose to gain success by fraud and cunning but doing this is not good at all because eventually good does overcome the bad. People that do everything on their own steam are individuals that others truly respect as well as look up to. If you want to gain success you should just do your best without preoccupying your mind with other thoughts. One of the most productive things to do so as to bring out the best in yourself is constantly pushing yourself. It is pressure that often brings out the best in a person so this is a method you should certainly apply. However make it a point that you do not go too far in trying to push yourself to achieve great success or you might find that in the pursuit of so much success you have stopped living life and appreciating the things which you already have. There is nothing more important in life than family so no matter how badly you would like to achieve great success you should try your best to take out time each week to catch up with your family we well as your loved ones. Making money is important however the thing more important than making money is making memories that will surely last you a lifetime. There is a great difference in merely existing and living and you should try your best to learn to differentiate between the two so as to live a holistic life. A productive thing to do in life would be to think about your future and try and set yourself a few goals and dreams which you would like to achieve. Having a dream gives you a sense of purpose and a reason to wake up each morning rather than just having no aims and expectations. Though it is important to have dreams that are reachable you should not sell yourself short. If you are a capable person you should not shy away from thinking of big things and working hard to achieve them. Having a proper work life balance is important so as to give each aspect of your life some of your attention. Very often people focus too much on one part of their life and end up regretting it later on. So, to avoid any dis-balance or even feelings of distress you should always try and strike a balance between the two so that you are able to get the best of both worlds. Once you have been blessed by God you should make it a point to help those who might not have as much as you do. Even a little help could really go a long way in bringing a meal on the table for a family or even helping to bring a smile to someone’s face. It is not important to only help financially there are numerous other things to do so as to make a difference in the life of someone, you could make someone’s day simply by spending a few minutes chatting with them. You should never shy away from trying new things no matter how daunting the whole thing might appear to be, this piece of advice does not merely apply to the youth it applies to one and all. It is never too late to learn new things and gain knowledge in things that you previously had no idea about. Companies always prefer to hire those individuals that are always ready to pick up new things without making a fuss. One of the most productive things to do in life would be to start believing in yourself. In order to make others believe in you the first step is to believe in yourself and your own capabilities. If you have self awareness then no matter what others might say to you, you keep holding your own head up high and moving onwards. If you believe in all that others say, you are doing nothing but feeding your own insecurities and putting yourself down for no reason at all. Working hard is important in order to climb the ladder of success however an equally important thing for you to do is to ensure that in life you give equal attention to hobbies that interest you. No matter what your hobby is or even whether you are good or bad at it you should always make time to do it simply for the joy that it is able to bring to your life. So whether it is cooking, baking, sewing, singing, dancing, gardening or anything else you should not shy away from doing it. Very often in life we feel bowed down by the various trials and tribulations which we are called to bear, but at such times a productive thing to do would be to appreciate the blessing which have been endowed on us. One thing that not many of us are able to do, is appreciate the little things in life like the beauty of the sunrise or the sunset, the singing of the birds or even the boon of good health. So these would be some productive things you can do so as to make your life more meaningful and pleasant. If you spend too much time being depressed and worried then you end up not appreciating the countless things that you do have. Focusing on the positives and letting go of the negatives could really help you feel both alive and rejuvenated. Your life is your own so you should do things that make you happy rather than trying to live up to someone else’s expectations from you.